PRASHAM provides the latest non-intrusive biometric security solutions. These biometric security products incorporate fingerprint, face, iris, voice, and signature recognition. These biometric technologies can be used separately or together in one powerful package to meet your entire authentication and identification needs. PRASHAM also offers customized solutions to allow integration of our biometric security software with your existing IT environment. Our biometric devices and biometric software products include Fingerprint Time & Attendance, Fingerprint Access Control systems, USB Fingerprint Scanners, Embedded Fingerprint reader Modules, Fingerprint SDK (API), Biometric Computer Logon, Mobile Fingerprint Scanner, Iris Access Control system, Web Based ID, Signature Verification, Voice Authentication Systems PRASHAM's proven technology allows customers to develop highly scalable biometric security solutions.Our FBI certified award winning biometric devices & fingerprint scanners have rugged design and an unmatched fingerprint capturing capability. 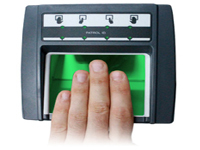 Our fingerprint readers are ideal for government and enterprise applications.